So yesterday the 11.3.0 release of the XO-OS went gold. Its the first release to support the ARM based XO-1.75 and as a result the XO-1.75 is also the first commercial product to be based on Fedora ARM! This is the culmination of over eight months of solid work for me. There’s a number of interesting points of these releases that the Fedora community might not be aware of. The 11.x releases of the OS have been derived from Fedora 14. Pretty much the entire release is built from mainline Fedora with very few differences, and most of those are patches to the kernel including build related stuff, and a few patches to the Sugar UX to assist with deployments. I strongly suspect that the 11.x releases are the largest deployment of Fedora 14 anywhere 🙂 and probably also of the gnome desktop and its components too. Moving forward from this release we’re investigating moving the OS release process to mirror rawhide. We’re aiming for the XO-OS 12.1.0 release to be based on Fedora 17 and be released around a month after the main Fedora 17 release. Its going to be a massive release as its encompassing a move of the Sugar UX to gtk3 and gobject-introspection and associated underlying changes as well as jumping to other newer technologies like systemd and NetworkManger 0.9. I’ll be doing a release of Fedora 16 on XO for the XO-1 and XO-1.5 with the latest sugar 0.95.x development release for olpc/sugar developers and others that are interested in testing. I’ll also be doing regular snapshots from rawhide throughout the release process. One of the advantages I see in moving to rawhide is that we’ll be testing the functionality the OLPC uses and depends upon as its being pushed to rawhide which means we can catch all breakages as early as possible and file bugs or generally bother people while its fresh in their minds rather than trying to get fixes for things that broke in the dev cycle two releases ago and that the developer likely doesn’t have any interest in any longer. The Rumor Of My Demise Has Been Greatly Exaggerated! So what has this slacker been up to? Well quite a lot actually! I’ve started my tenure on the Fedora Board. I’m some what into the groove now but I need to start blogging more about it too. There’s all sorts of other things going on but I think that’s the biggies. Hopefully I’ll be able to start blogging more in the coming weeks! Posted on August 26, 2011 December 9, 2013 Categories ARM, FedoraTags ARM, Board, Mobility, OLPC, SoaS, SugarLabsLeave a comment on The Rumor Of My Demise Has Been Greatly Exaggerated! I’ve been meaning to do a post with details of all the small devices I have. Not all the devices pictured below currently run Fedora although nine out of the twelve shown either currently run Fedora or I’ve had them boot Fedora. The three devices that don’t, as yet, boot Fedora are devices 8, 9 and 11. There’s no reason why they can’t as they all run some form of Linux, in the case of 8 and 11 its Android and 9 is a Logitech SqueezeBox Touch. One of the things that I’ve been trying to achieve in Fedora for many years is slimming of the required dependencies of certain combinations of installs. Not everyone needs everything, and not everyone has Terabytes of storage that can be thrown about. All the devices have WiFi, some have wired Ethernet, some 3G, GPS etc. There’s two main issues with smaller “mobility” devices. Firstly is the GPU support is obviously a mixed bag, there’s obviously AdamW’s favourite GPU… the Poulsbo on the Intel Z5xx series atoms. The Poulsbo is basically a variant of the PowerVR GPU’s that Intel licenese. Unfortunately this is still basically the case for the new Z6xx series which contain a GMA-600 Poulsbo device. Buyer beware! Its been leaked this week that Intel for later generations isn’t going to improve the situation as they just going to use the PowerVR GPU directly. This is the second release running that another component of the Fedora Feature process has come and bitten me in the proverbial. This time its the “Major Features”(tm), must be landed by the Alpha release, part of the process. For Fedora 14 the feature that abused this requirement was python 2.7. Rather than landing by the Alpha release it landed moments before we locked down for the Beta breaking things horribly and causing massive amounts of work post Beta when we were suppose to be stabilising the release. This affected Sugar amongst massively as that’s the language its primarily written in. For Fedora 15 the abuse was by NetworkManager. Complete API borkage with very little notification (well at least that I saw) moments before the Beta release. Unfortunately again its Sugar that takes the hit and it looks like we’re not going to have it working by release. I’m doing my best to attempt to teach myself python to hack up some form of support but given I’m just learning python converting a network stack isn’t the easiest of things, and work seems to get in the way at the least opportune of moments. I don’t want to blame developers. Everyone has different agenda’s and issues that they try and balance but what really pisses me off is that its not in by the alpha, or if its going to be massively late there needs to be a lot more heads up or assistance. BTW Massive big kudos to the Evolution developers for getting this pretty close to right for both the F-14 and F-15 releases as they were going through huge API changes. If that’s not going to happen then FESCo or The Board or whoever is in charge of developing the “feature rules and policy” actually needs to bloody well enforce them and say “sorry it needs to go in the next Release”. They do after all have all the way back to alpha of the previous release to land the feature (that was the whole purpose of forking rawhide at alpha and not later in the process) and have all the breakage they like. It gives six months for poor mugs like me to either, organise other busy upstream developers to help, or to work out how to code in python myself to fix it, rather than what seems like six days to attempt to scratch something together. It won’t be popular but maybe a single high profile incident will make everyone step back and think about others and how they may affect them. With the upcoming FESCo and Board elections I look forward to what people have to say. Why not run for them yourself I hear you say? I’d personally love to but unfortunately with a number of other things going on in my life at the moment I don’t have the time. Either I would have to drop all the package and Sugar/OLPC stuff I’m currently doing to make enough time for it, becoming again a pure Fedora consumer, or remove all traces of the scant personal life that I currently have. I don’t currently wish to do either. Wow what a busy day! We started off with BarCamp pitches followed by the FPL traditional “Fedora State of the Union” talk from Jared. 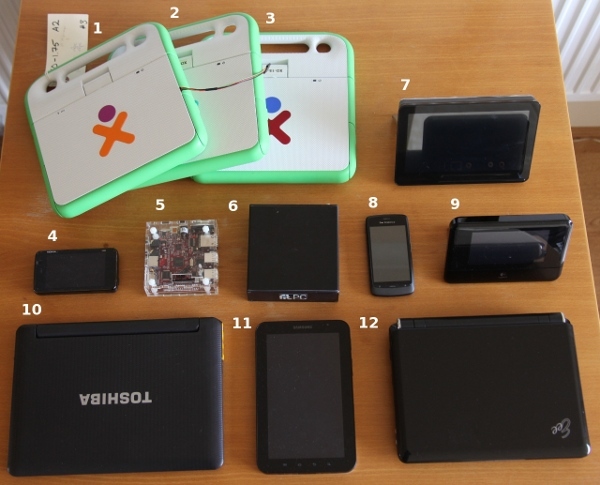 The first BarCamp I went to was the Fedora on ARM including an update of OLPC on Fedora from Martin Langhoff. Very interesting and there was a lot of interest in my Toshiba AC100 SmartBook running Fedora 13 ARM on the nVidia Tegra250 dual core ARM A9 processor. Lunch was very interesting. All the people involved in Sugar on Fedora got together for a chat about what everyone was up to and how things were working, and a quick discussion as to what different parties saw from Sugar on a Stick and whether it was useful. The people in attendance (from memory) were myself, Sebastian Dziallas, Mel Chua, Simon Schampijer, Martin Langhoff, Stephen Parish, Bernie Innocenti, Dennis Gilmore and Samuel Greenfeld. It was good to chat face to face about the requirements and challenges of Sugar in Fedora and the various requirements of Fedora, OLPC, SugarLabs and third party users like the Dextrose crew. There were many other hallway chats about various Sugar related things including with Adam Williamson and Samuel for QA related testing of Sugars and associated components, and with Martin about XS Server related things. The whole day was very sweet (pun intended!) with Sugar related discussions. Of course the discussions didn’t stop there and continued into the evening at FUDPub. After lunch I attended the Education übertalk which was very interesting about various means of teaching open source from Máirín’s teaching of design and graphics through open source applications, to ctyler’s 15 minutes on teaching open source at universities and how that’s allowed them to use Fedora as a showcase of a release process because its all open, and of course Mel and Sebastian’s slot of POSSE. All very interesting and very different takes on getting open source out there. I managed to make it to Mike McGrath’s talk on cloud, although I didn’t make it to enough cloud related talks over the weekend, because as always there seems to be way too many cool things to attend and way to many conflicts! The discussion about Fedora Spins and the future there of was also very interesting. Its something that’s been long over due and while we didn’t have enough time to get through all the required bits to discuss I feel that we got enough of the root ideas out and discussed and noted down to be able to take the rest of the discussion to the lists. I was very interested in this and in time there should be some nice improvements to enable some improvements to the way the spins process that should greatly help both the Sugar and possible future MeeGo spins. In the evening there was the traditional FUDPub. And what fun it was too. Although I do place the blame for how I felt the following day on Martin and Simon for moving me from drinking beer to Cuba Libre’s and big ones at that! Having arrived in Tempe for FUDCon late on Thursday evening having been in transit for close to 24 hours it was great relief to meet up with Mel and Sebastian at the hotel. After a great nights sleep, except for a massively sore neck, it was great to get up on Friday morning to find people starting to arrive and the office hallway track begin to take shape. I went out in the afternoon to get out and about from the hotel and see a little of the surrounding areas. By the time I got back a huge crowd had started to gather and it was good to catch up with adamw, jsmith, dgilmore, pfrields and many many others. FUDCon officially started with the first birthday party of OpenSource.com with beers, pizza and cake provided them to assist the conversations and celebrations.